Dar Essattatia, located in the Medina, typical district, change of scenery guaranteed. Taxi stand and all the commodities nearby. The price indicated is for 8 persons maximum (children included) for the all house during 1 week. It has 4 double bedrooms, ideal for 2 families or a big one. Khadija (the housekeeper), is here during the day. She takes care of the food purchase, the cooking and the cleaning. Her services are included in the rental price. She cooks very well and speaks French. The airport transfer is also included in the rental price. There is a bathroom on each floor with shower, WC and wash basin. All are decorated in the Moroccan style (see pictures). Separate hot water tank in each shower room. The biggest advantage of this rental is the fact that the cooker cooks extremely well. She takes care of the food purchase, the cooking and the cleaning without extra cost. The only thing that you pay is the food. Sheets and towels are provided. Additional heating, large terrace sunshade that can be removed was added for winter in the patio. Air-conditioning is in each bedroom and in the African living room. Essattatia. The owner, Philippe, was responsive to all our questions & helpful with all the information we needed. The Riad was comfortable and the many rooms had lovely touches. It's located on a quiet street in the Bab Taghzout neighborhood in the Medina w/ easy access to taxis. The souks are an easy walk & so is the Jema el Fna. The manager, Mostapha, met us at the airport & took us to the riad. He was a valuable source of information & suggestions & greeted us every morning to help w/ any arrangements we needed. Khadijah prepared our delicious breakfasts & on request served us fantastic dinners. She shopped for fresh foods each day & spent hours preparing these traditional Moroccan meals. She also took care of all the housekeeping duties & kept the riad spotless. Both she & Mostapha were great w/ the children & we all felt like we made two new friends. 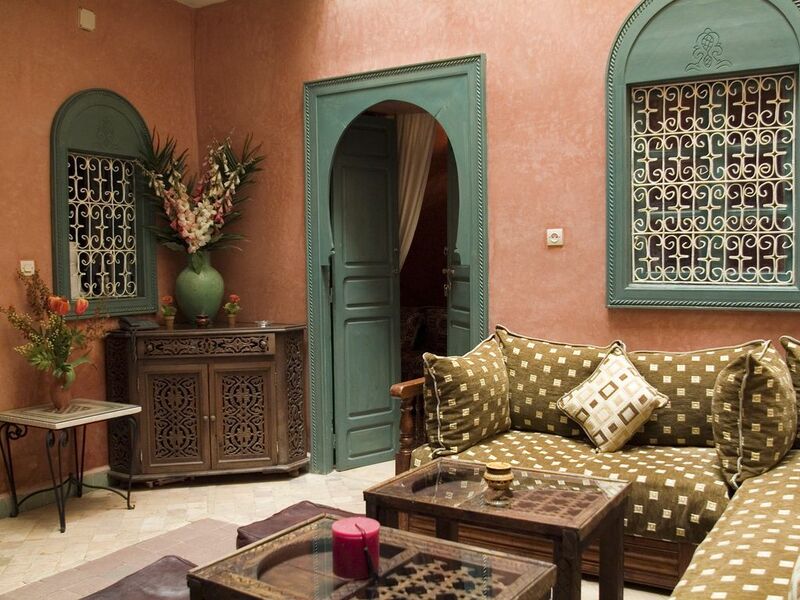 We would highly recommend this riad for a great Marrakech experience. Merci pour ce merveilleux témoignage qui nous va droit au coeur et nous comble de joie. Nous garderons également un excellent souvenir de votre passage à dar Essattatia, en espérant vous revoir lors d'un autre séjour. Family of 7 (4 adults and 3 kids) spend 3 nights in Riad Essattatia, We received a very warm welcome from Mostapha and Khadija who has prepared a delicious chicken tajiin for dinner just as well as she served us a nice morrocan breakfast and fresh pressed orange juice every morning. Khadija is a very lovely lady, she only speaks arabic and french but we managed it anyway. Mostapha is also very friendly guy with a good sense of humor, speaking a very good english and he informed us very well to let us loose in the Medina with do's and don'ts). The riad is very beautiful with spacious rooms and lovely bathrooms, a great great rooftop with a spa and a nice corner for the hole family to relax. We hope to come back soon and we definitely recommend Riad Essattia and it's lovely staff. Merci pour ce gentil commentaire.Nous gardons également un agréable souvenir de votre séjour à Dar Essattatia et auront le plaisir de vous revoir une prochaine fois. Everything was great. Khadija and Mostapha were wonderful and so helpful. Phillipe was very quick to respond to my inquiries before renting the Riad and was so helpful in answering my questions. I would recommend this Riad to anyone traveling to Marrakech. The riad is central and beautiful. Khadja is such a great cook we ate all our dinners at home, and Mostapha is very helpful and charming. Our whole experience was OUTSTANDING!!! Thank you for taking the time to give your opinion and share your tips with the homeway community, see you soon in dar Essattatia. Stunning Very Clean with a super roof top area that has a hot tub and sitting area with a table. i had a wonderful holiday with my family. the riad was stunning.clean and very clean. Our housekeeper/chef was so friendly and the meals she prepared for us were gorgeous. and served up in such beautiful designs. we all had an amazing time in Marrakech and will not hesitate to recommend the riad to friends. Notre personnel gardera un excellent souvenir de votre venue, nous espérons avoir bientôt l’occasion de vous recevoir à nouveau. I am writing to thank you for the amazing hospitality I received from Khadija and Mustapha. I can categorically say that it was one of the most pleasant stays I have had. Khadija was very accommodating and her cooking was exquisite. Mustapha was very inviting and respectful, a very helpful and well mannered gentleman indeed. I'd like to thank you for our lovely stay, all the best from our family to yours. Thank you very much for this nice recommendation, we are very happy that you had a good time with us and hope to have the pleasure of seeing you very soon. At the heart of the Marrakech medina, Sidi bel abbès district. Halfway between the Majorelle garden and the renowned Jemaa el Fna square. Change of scenery guaranteed. En période de vacances scolaires toutes zones confondues la maison se loue généralement du samedi au samedi pour une semaine minimum.